Victor Oladipo pulls up for the game-winning three-pointer with three seconds left as the Indiana Pacers win a close battle over the Boston Celtics, 102-101. 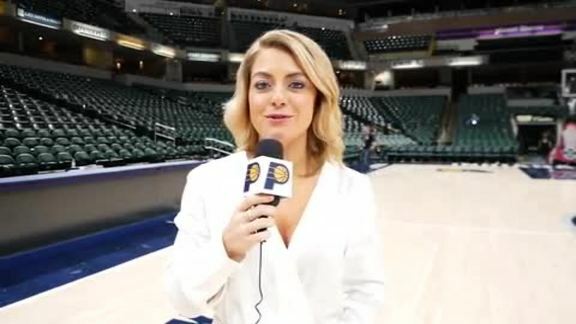 November 3, 2018 - Following the Pacers' thrilling 102-101 win over the Boston Celtics on Saturday night, Pacers.com's Katie Hargitt recaps a night in which Victor Oladipo hit one of the biggest shots of his career, a game-winning 3-pointer with three seconds on the clock. Nov. 3, 2018 - Victor Oladipo, Darren Collison and Thaddeus Young discussed Indiana's thrilling 102-101 win over the Boston Celtics on Saturday night at Bankers Life Fieldhouse. 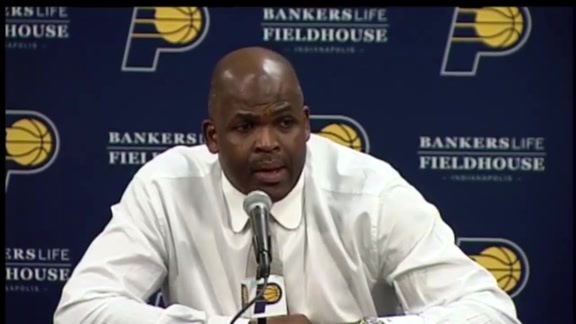 Nov. 3, 2018 - Pacers head coach Nate McMillan speaks with the media following Indiana's thrilling 102-101 victory over the Boston Celtics at Bankers Life Fieldhouse. The genuine clutch players, the ones who seek the heat of the spotlight like sunflowers turning toward the sun, have bad memories. Doesn't matter if they've gone 1-of-5 from 3-point range, doesn't matter if they've gone 2-of-12. They believe the next one will go down and aren't afraid to find out. Victor Oladipo's forgetfulness and optimism Saturday completed an astounding week of pressure-packed shooting that vaulted him into the thin air previously occupied only by Reggie Miller and Roger Brown in the history of the Pacers franchise. 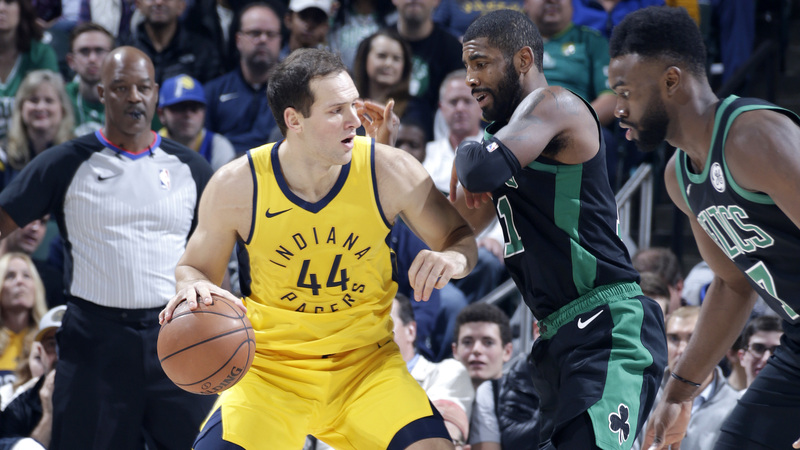 His pull-up 3-pointer in transition gave the Pacers a 102-101 victory over Boston that seemed to have more meaning than an early November game is supposed to have, given the circumstances. They were playing their fourth game in six days and part two of a back-to-back set, and playing it against the team most widely favored to come out of the Eastern Conference and challenge Golden State for the championship. It was a gut-check on many levels, but Oladipo had the stomach for it. 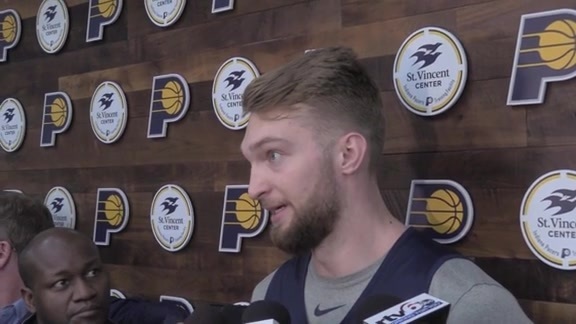 "It's just amazing," Domantas Sabonis said. "He keeps getting better and better." Oladipo had hit just 3-of-12 3-pointers up to the point the Pacers got the break of a missed layup by Kyrie Irving with 11.7 seconds remaining. Oladipo grabbed the rebound and headed upcourt. 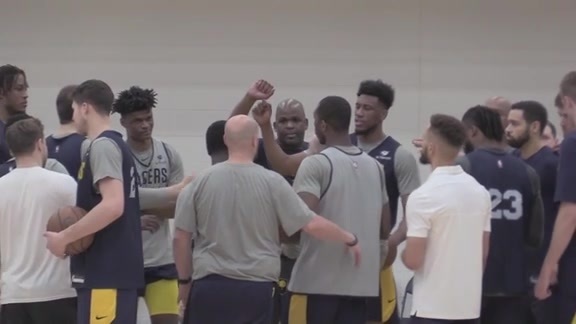 Coach Nate McMillan had already told them in the previous timeout to push the ball upcourt off a missed shot, and Oladipo pushed it – all the way to the 3-point line on the right side, where he pulled up and drilled a three over Al Horford with 3.4 seconds left. Those turned out to be the final points, thanks again to Oladipo who stole Gordon Hayward's ensuing inbound pass to complete an improbable comeback from a four-point deficit with 37.2 seconds remaining, one that had convinced some of the fans in Bankers Life Fieldhouse to get a jump on the traffic toward home. They should have known better, especially if they had watched the Pacers' wins over New York and Chicago earlier in the week. Or, for that matter, most of the games last season. Wednesday at Madison Square Garden, Oladipo had hit just 1-of-7 3-pointers through 47 ½ minutes, but hit one with 1:23 left and another with 21.6 remaining, not to mention two foul shots with 4.8 seconds left, to lead a 107-101 victory over New York. Friday at the United Center, he was 0-of-5 from the 3-point line until he hit one with 4:33 left to tie the game, then added a short floater at 3:54 and two free throws with 37.1 seconds left to ignite a 107-105 victory in a game Chicago had once led by 18. Saturday's finishing touches were just the continuation of a theme, one that goes back to last season. McMillan knew Saturday's 3-pointer in transition looked familiar but couldn't quite place it. He must have been thinking of last season's victory over the Bulls on Dec. 6, when Oladipo stole the ball and hit a three in transition with 31.1 seconds remaining to complete a comeback from a deficit that had stood at 16 points with 9:41 left for a 98-96 win at the Fieldhouse. Then there was his game-winning 3-pointer out of the halfcourt offense with 10.1 seconds left on Oct. 29 that delivered a 97-94 victory over San Antonio, not to mention countless other "big" shots in a season that brought the Most Improved Player award to Oladipo. Should people be amazed by what they saw this week? "Yeah, but then again, no," Darren Collison said. "Now it's starting to be the norm. Now it's starting to be something that you're accustomed to seeing. "Not a lot of all-stars would be able to take that shot he shot. His composure, his confidence, everything … I don't know how he does it, you have to ask him." Sitting in front of his locker and spitting phlegm into a paper cup because of the bronchitis he's been fighting for the past week, Oladipo had no explanation why some players rise to the occasion and others disappear. "I can't tell you that," he said. "I don't know. It's just winning time. Go make the play." The ones who can do just do it, whether they're having a good shooting night or not. Told the details of the off night he was having, Oladipo feigned ignorance, as he tends to do whenever a negative stat is brought to his attention. "I missed that many?" he said. "I don't even remember." Miller was conveniently forgetful, too. Every Pacers fan is aware of his legendary eight-points-in-8.9-seconds flurry. Not everyone recalls that Miller had hit just 5-of-16 shots heading into the final seconds of that playoff game in 1995, including 1-of-5 3-pointers, before draining two of them within the blink of 18,000 eyes in Madison Square Garden. Miller once said he liked the odds when taking clutch shots. The odds aren't that good, really, for any player throwing up a 3-pointer in a crucial moment, certainly less than 50-50, but he had convinced himself otherwise. Oladipo must carry the same gene that brings blind optimism. "Oladipo Time" doesn't have the same ring to it as "Miller Time," but he's bringing back memories. He'll have to have these kind of moments in playoff games, too, but he's still building an impressive crunch time resume. "You've just got to keep shooting," he said. "A lot of my shots today were just short, they were on line. They were good shots, open shots, I just missed them. That doesn't mean you should stop shooting. I've worked too hard to stop and not believe in myself." Oladipo has a saying about moments such as those he experienced this week. "Down two, shoot three." Meaning, when you're down two points you should go for three to win the game. He repeated the mantra throughout his summer workouts in Miami. They represent the thought process of players with a killer instinct. 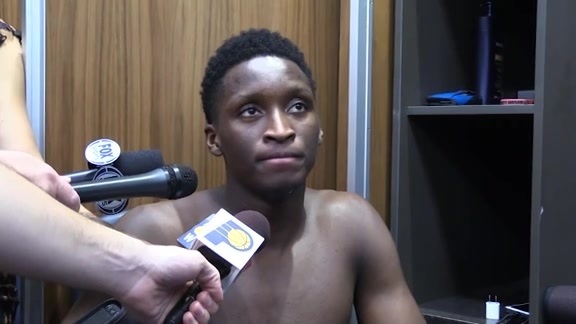 "Not because I'm saying I have to (shoot a 3-pointer) every time, but you have to give yourself the confidence to do it," Oladipo said. "I'm not going to say every time we're down two in a home game I'm going to shoot a three, but I'm just going to make the play that's there." Oladipo's confidence is contagious. He helped lift the Pacers to 48 victories last season, about 15 more than was generally forecast for them, and he's helped get them off to a 7-3 start this season. Saturday's victory was the most impressive yet, coming against an elite team that was more rested and fought hard. "I told our guys before the game we want to play like we believe we can win this game," McMillan said. "We're not going to make excuses for the schedule. This was a tough back-to-back, and all I asked our guys to do was play like you believe you can win this game. And they did."